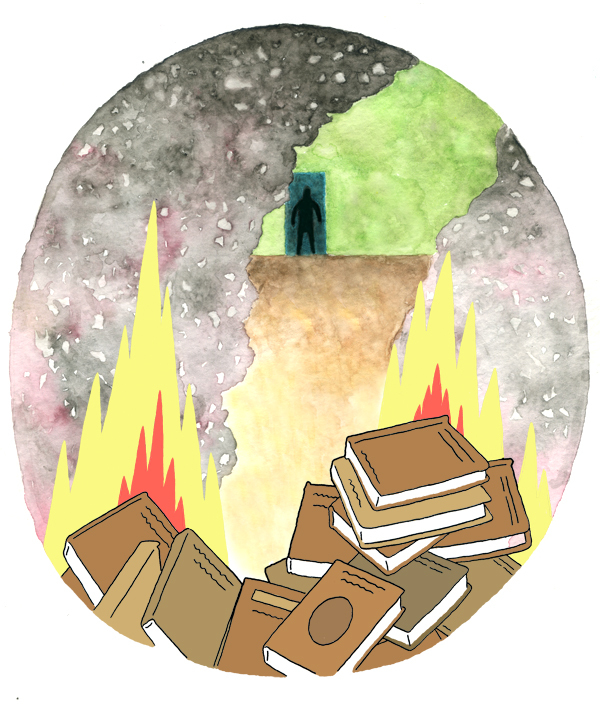 This is my visual interpretation of Fahrenheit 451 by Ray Bradbury, one of my favorite science fiction novels. Way back in october I went to a National Portfolio day to have my portfolio reviewed by SVA. They told me I should try to illustrate a text. Well here it is USA. Read it and weep. I think I'm gonna attempt one more of these soon. Also, come monday I'm going to start posting my comic strip that I am doing for The Daily Beacon, my school newspaper. That's so awesome that you're the cartoonist for TDB. Great illustration, too. F 451 is one of my favorites as well. Keep churning 'em out man.